Jose Mourinho plans to coach Real Madrid one day - he just won't say when. 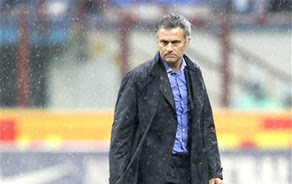 In an interview to be published in the Italian magazine Panorama on Friday - excerpts of which were released Thursday, Mourinho says he ''will coach Real Madrid'' sooner or later. Mourinho can clinch the Serie A title with Inter Milan this weekend, and his team faces Bayern Munich a week later for the Champions League title.